Two Yemeni asylum seekers have been taken into custody on the southern island of Jeju for using violence against each other in a fight over washing dishes, police said Monday. The two, who are aged 36 and 37 and work as crewmen, allegedly brandished weapons or punched each other Sunday afternoon after quarreling over washing dishes in the crewmen's quarters they live in, police said. Police said they're questioning the two and will decide how to deal with them after consultations with immigration officials. 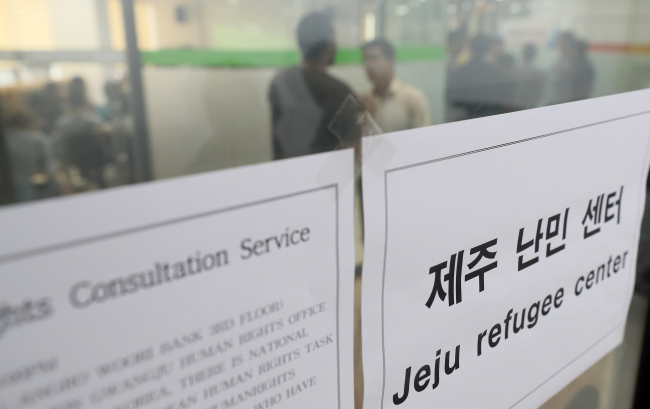 The case came amid growing anti-refugee sentiment in Korea sparked by the arrivals in recent months of more than 500 Yemeni asylum seekers on Jeju under a visa-free entry program aimed at promoting tourism. Their entry has sparked worries that many of them could be bogus claimants seeking jobs and other economic advantages, that similar arrivals could follow, and their presence would lead to increases in crime and other social problems.